FOUR of 7-19 Volt Universal LEDs one input! This very bright unit consists of 4 LEDs connected to one input with one bridge rectifier / resistor / capacitor unit. It is plug and play, ready for for use with 7-19 volts of AC, DC or DCC power. Each LED is on it's own fine 8" wire. The maximum distance apart you can reach these little lights is about 15-16 inches. 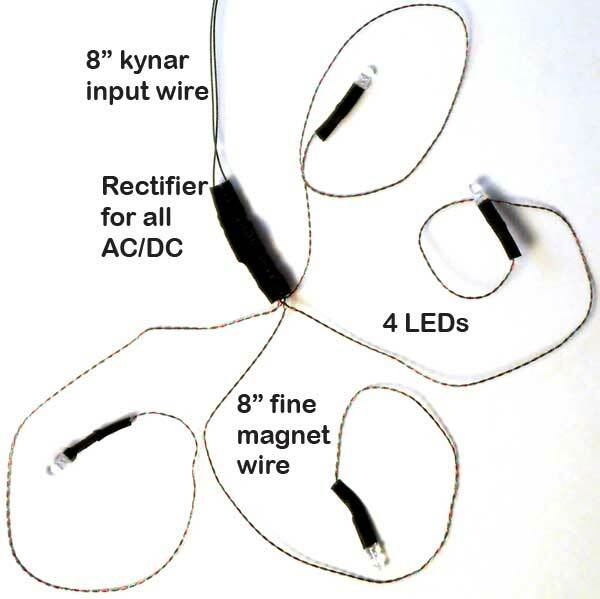 Of course with the fine wire you can also locate them closer together, just loop or tape the extra wire out of the way. This is a great bright way to add nice light to your train, passenger station, building(s), your own ideas! This unit was originally suggested by our friend Stephen Priest, Master Model Railroader. He uses it for HO scale locomotive and passenger car lighting.